Hypotension, defined as dangerously low blood pressure, is a significant risk factor in intensive care units (ICUs), which requires a prompt therapeutic intervention. The goal of our research is to predict an impending Hypotensive Episode (HE) by time series analysis of continuously monitored physiological vital signs. Our prognostic model is based on the last Observation Window (OW) at the prediction time. Existing clinical episode prediction studies used a single OW of 5–120 min to extract predictive features, with no significant improvement reported when longer OWs were used. In this work we have developed the In-Window Segmentation (InWiSe) method for time series prediction, which splits a single OW into several sub-windows of equal size. The resulting feature set combines the features extracted from each observation sub-window and then this combined set is used by the Extreme Gradient Boosting (XGBoost) binary classifier to produce an episode prediction model. 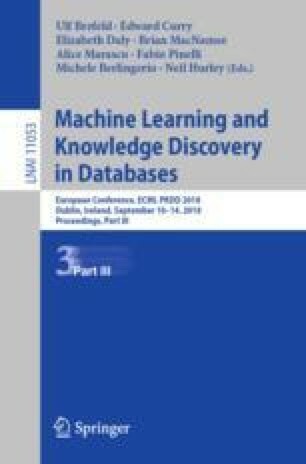 We evaluate the proposed approach on three retrospective ICU datasets (extracted from MIMIC II, Soroka and Hadassah databases) using cross-validation on each dataset separately, as well as by cross-dataset validation. The results show that InWiSe is superior to existing methods in terms of the area under the ROC curve (AUC).